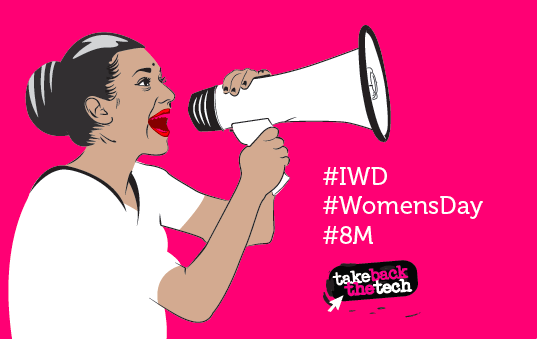 In addition, we've put together a list of actions Take Back the Tech! campaigners and partners are planning for International Women's Day. These actions help women feel safe enough to use their voices, uplift women's stories, and create a chorus that rings through the streets. They are spread out in multiple countries, so even though it's impossible to participate in all of them, you can see what's going on in places like Mexico, India and Lebanon and feel like your voice is part of that greater chorus. Strike, march and share online and on-ground. Sing out for change. Take back the tech! Several women's groups, including TBTT campaigner Foundation for Media Alternatives, came together to release a statement expressing opposition to the policies of President Duterte. The Women's Manifesto is a document of Malaysian women's demands from 10 thematic areas, endorsed by various movements in support of gender equality. The demands are towards the creation of a more enabling environment for the respect, promotion, protection and fulfilment of human rights on the basis of gender equality. Organised by Safecity, which uses tech to crowdmap data on sexual harassment in public spaces. Trainings and activities in different countries throughout March to celebrate the launch of the new site on digital security from a feminist perspective. Women human rights defenders from Thailand, Burma and the Philippines will discuss how conflict disproportionately affects women and girls. Many TBTT campaigners will be there, including Luchadoras, who will offer a workshop on storytelling and a Feminist Internet. Flowers will be given to survivors of extra-judicial killings and Foundation for Media Alternatives will speak at the end about online gender-based violence. Follow @UprisingofWomen for more information. @geekandqueer will be there too!